BraveNewCoin Compares LBRY to Alexandria: Who Will Be the First to Supplant BitTorrent? Perhaps our biggest critique of Alexandria is their waste of money in buying all those vowels ;). Perhaps the most interesting difference is the naming system, which works a lot like the internet's Domain Naming System (DNS). LBRY in much the same way you would register a domain name for your website that starts with an http://, in LBRY, you would register a name for each piece of content that you want to share, and those start with lbry://. The idea is that web browsers will eventually read those links automatically so that you can simply click on an URL like lbry://wonderfullife in order to watch the movie "It's a wonderful life." Both Alexandria and LBRY have their strengths and weaknesses, and perhaps both will find a niche and thrive. Without accepting bitcoins, however, LBRY could have a tough time convincing users to buy and use an additional currency. Meanwhile, Alexandria has a clear lead in development. No matter which succeeds, we can all look forward to new ways for publishers to distribute content. The truth is that the LBRY protocol will allow patrons to pay publishers and hosts in BTC, though the default is LBC (LBRY credits). So as far as the patron is concerned, LBRY can run on bitcoin. The only time a user must use LBC is to reserve a name to ​publish​ content. 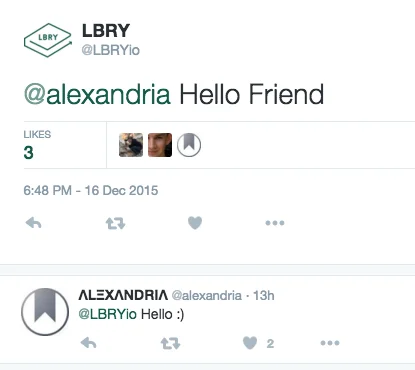 You don't have to take our word for it – start playing with the LBRY protocol yourself! Sign up here to become an Alpha Tester and earn 1,000 LBC.